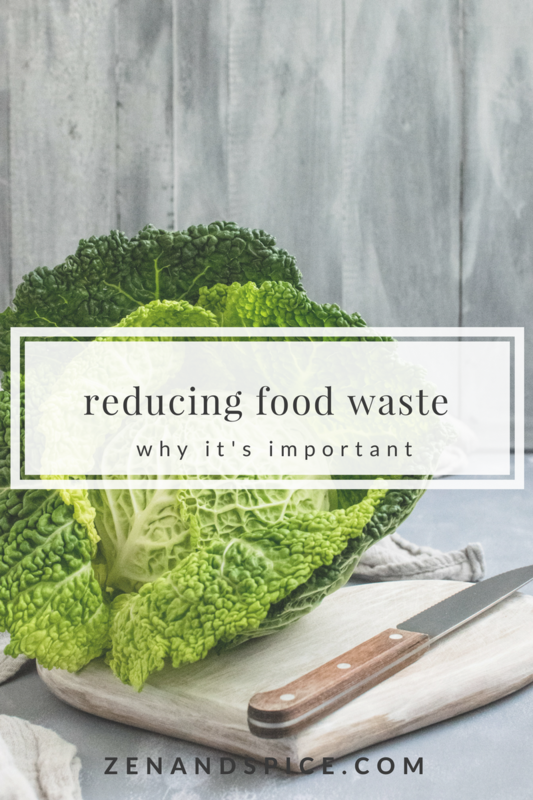 I recently attended a food conference and one of the speakers was an environmental expert who talked about how our world is dealing with such a large amount of food waste and what it’s doing to the environment. She was such a good speaker and presented the material so well, that I left inspired wanting to learn more about the food waste issue! If you look at the numbers, in 2010, the US wasted 133 billion pounds of food. That’s a huge amount, and that was six years ago. When 15% of our country is food insecure, it’s tough to see so much go to waste when so many are hungry every day. The extra and wasted food this country throws away could feed all 50 million hungry Americans and almost 1 billion hungry people around the entire world. When we throw away a mushy apple or expired ground beef, we’re not just throwing away food, but also all of the resources it took to make that apple or ground beef. All foods have a water footprint. The largest water footprint belong to meat. Think about it: this includes water to grow the animal’s feed, to maintain the farm, and for the animal’s drinking water. In 2010, Americans wasted 23% of every pound of beef, which accounts for 400 gallons of water. Food is often wasted because of how we prepare it or how perishable it is. I often find myself throwing out lettuce, cucumbers, dairy products at the end of the week because they’ve expired or gone bad before I had a chance to eat them, which is my fault for either buying too much or not planning well enough to use everything I buy! The USDA recently called for a 50% reduction in food waste by 2030. An estimated 9 million + more people will be in the world by 2050 and more soil will become unusable, which means 70% more food will be needed. Unfortunately, it’s just a way of life. It’s part of an apple here, a half-eaten dinner there. Americans are pretty picky about what goes into their refrigerators. A survey done by John Hopkins University found that 65% of respondents throw out food because of fear of food poisoning. About 60% percent said they only want to eat the freshest food. and 37% thought the food they throw away doesn’t cost much money. About 50% of all food waste happens at the farm and in transit before the food even reaches store shelves due to strict cosmetic standards for produce, the other 50% happens in our homes. The biggest motivator for most is the desire to save money. Each week, I have to clean out our fridge for anything expired or wilted, and I always end up throwing away a couple containers of old leftovers, shriveled lettuce, a cucumber and a piece of fruit or two. If I added that up, I would probably guess that it’s somewhere around $5-8 of food. Over the course of a month, I could be throwing away over $30 worth of food! It is literally throwing away money. What can we do on our end? Think about your grocery store: the perfectly aligned rows of fruit and veggies. Six billion pounds of ugly fruits and veggies are wasted because they don’t meet visual standards. This wastes 20 gallons of water per pound. Revisions of these regulations and standards for fruit and veggies are so needed! 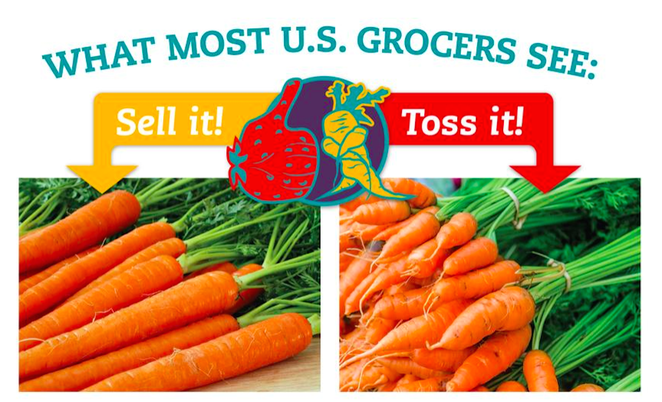 Grocery stores need to know that the public is okay with irregular shaped produce. It’s not only perfectly safe to eat, but it tastes exactly the same once it’s prepared. 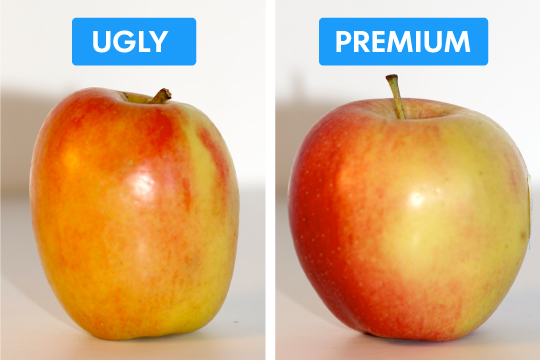 You can follow the @UglyFruitandVeg movement on Twitter. Is the appearance difference enough that you would pay double for the apple on the right? Imperfect Produce is a Bay area startup, who is selling “ugly” fruit and vegetables for 30-50% less. I don’t know about you guys, but I’d be perfectly fine paying 50% less for my produce just because it’s a weird shape. Weird is wonderful! It is normal in nature for each piece of fruit or vegetable to look a little different or be a slightly different shape. Another company trying to close the food waste gap is Hungry Harvest. This company buys ugly produce from local farms, bags it up, and delivers it to weekly subscribers. It’s like a CSA for ugly produce. Hungry Harvest was recently on Shark Tank (we are obsessed with this show) and got a $100,000 investment from one of the sharks, which I thought was really neat. Last week, the grocer Giant Eagle became the first supermarket in the US to start selling ugly produce with it’s new “Produce with Personality” program. Another supermarket giant, Whole Foods, announced on Friday that they will soon be joining Giant Eagle selling imperfect produce. Hopefully, more supermarket chains will catch on! We don’t have Giant Eagle here in Texas. 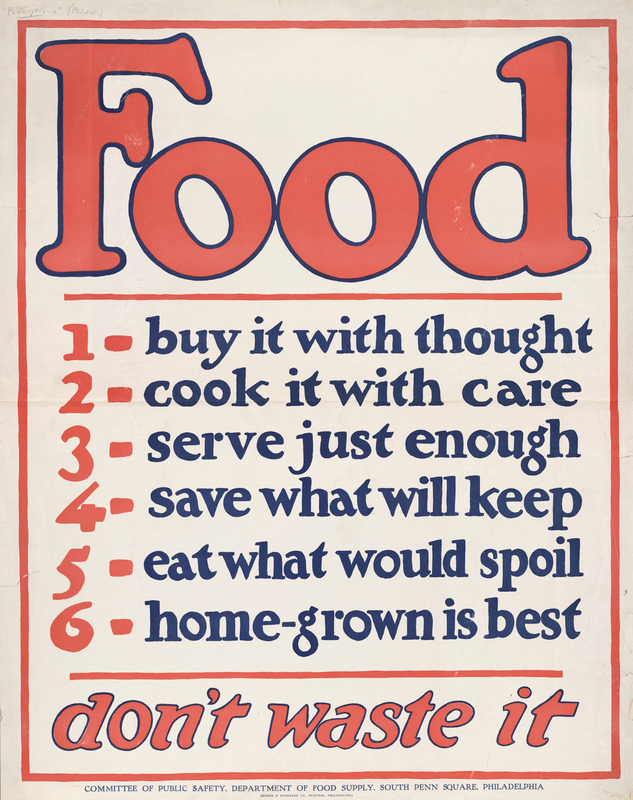 In the meantime, I’m going to focus more of my efforts on reducing the food waste in our household! im very guilty of doing that too..sometimes i over estimate what i will consume…esp sometimes produce will wilt away. this is such a undertalked subject but a very important one. i think making a detailed grocery list really helps. What a great post Emily – lots of food for thought here. The statistics are staggering and really make you think twice about how much food you purchase and how to use it. I have become a lot more careful about keeping tabs on what’s in my fridge, freezer, and pantry so I can plan my meals based on what I have on hand, not just the recipes that catch my eye on pinterest and in magazines. Sometimes my best new recipes come about that way. Can’t wait to see your food waste posts over the next six weeks! I was SO happy when I saw that Whole Foods would start embracing the “ugly” produce. I think they are a model for so many food things that hopefully it will help change mindsets.